While Tasha continues to go through “the terrible twos” and make a pest out of herself by ruining Annie’s paintings, Stink fakes a sprained ankle so he can get out of helping Kevin repair the tree house roof. This whole half-hour revolves around a cranky baby dinosaur, Tasha, a lazy Paku, Stink, and the series’ most irritating, unlikable character: Kevin Porter. “Misery Loves Company” features no sense of urgency, no outside menace, and no real narrative direction, even. Instead -- and as I mentioned last week -- the series plays like a sitcom or situation comedy instead of a fantasy adventure. 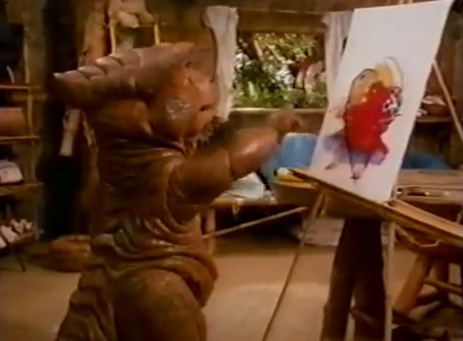 Admittedly, the sitcom was a highly popular commercial form when the series aired in the early 1990s, but the uninspiring format is such a disappointment to those who grew up with the adventurous 1970s version of Land of the Lost. After the thrills of that series, this Land of the Lost feels inconsequential, dominated by directionless, irrelevant material. 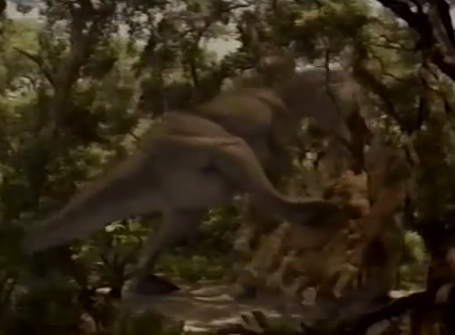 It has been many weeks since there was any real sense of danger on the series, and this is despite the fact that the Porters live in the middle of a jungle with dinosaurs, an angry renegade cyborg, Sleestak and other threats. Despite the locale, and the denizens, the series writers’ have not been able to marshal the resources to present a good or imaginative science fiction or fantasy concept in weeks, or even a compelling story that involves a clash between the Porters and the other inhabitants of the land of the lost. And so this two-season remake ends rather poorly, having failed to dramatize memorable or important stories, or even boast a leitmotif like the original’s statements about environment and community. Instead, this Land of the Lost concerns itself with pratfalls and jokes, like the damaged roof spilling water onto Kevin’s head. Sometimes perspective is everything, and so I would note that if you go into this series expecting a family-oriented situation comedy involving Pakuni and dinosaur hijinks, you likely won’t be disappointed by what you get. But if you grew up with the Marshalls and the original Land of the Lost, you’re going to find the lack of ideas and the lack of real intelligence in this remake a quality that is virtually impossible to overcome. This final episode of the series ends without a final appearance by Christa, the most appealing character on the series, and with another cameo appearance of Timothy Bottom’s Mr. Porter. 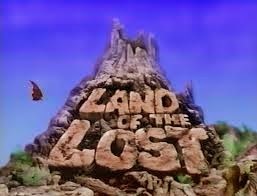 The series also ends with the Porter family stuck in the land of the lost. But in this case, being stuck in the land of the lost -- with a car, with a video camera, with a boom box and the other amenities of home -- is hardly a cause for concern, let alone interest. It’s sad that this series had two full seasons to develop a mythology and universe, but it settled instead for moralistic tripe about drunk driving (“Cheers”) using firearms responsibly (“Make My Day”) and so forth. The 1990s Land of the Lost thus goes down in the books as a wasted opportunity, and as a pale echo of a far superior originator. I never got to see the series in its entirety when it aired and so I had always been curious about it. But now that I have watched every episode, I’m not at all certain it was time well-spent. If I had to recommend a few episodes, the individual titles to check out would be: “Siren’s Song,” “Kevin vs. The Volcano,” “Flight to Freedom” and “Dream Maker,” which is arguably the best episode in the entire run. This final episode proves it did not deserve a third season. John very honest review of this painful to watch series. I think the writers were not even trying in the last group of episodes. What bugs me about this series is that fact that it took this silly and sit-com direction in the first place. What possessed the creators of the show to do that? Was it the popularity of the series "Dinosaurs"? It seems so strange that the adventure oriented 1970s version served as a starting point, but that the creative team went so far awry. There is some good concepts and material there, but obviously the 1970s version of "Land of the Lost" is the one to see. I caught a few episodes of the 70s series when they re-aired it on Sci-fi channel when the feature film came out. I had memories of it being silly campy fun, but was surprised by how much more serious it was. I was born in 1987 and I have to give a Statement about the rants you write down. This was not just one of the - This was the FIRST Series on TV I was watching and I still Love to watch! Yeah!!! And that is like My dedication, my greatest Respect and all my Love for this Series! Annie Porter was just a Girl in her youth who was having fun! Christa, the Jungle Girl, was an amazing part of this Series! Stink - Haha - Stink! Mnhhh... ^^ Stink was the funny and crazy Paku. He was a mystery too! He told about the time before the Porters came to this place and about his parents but we've never seen it.